Wow! Look at that view. 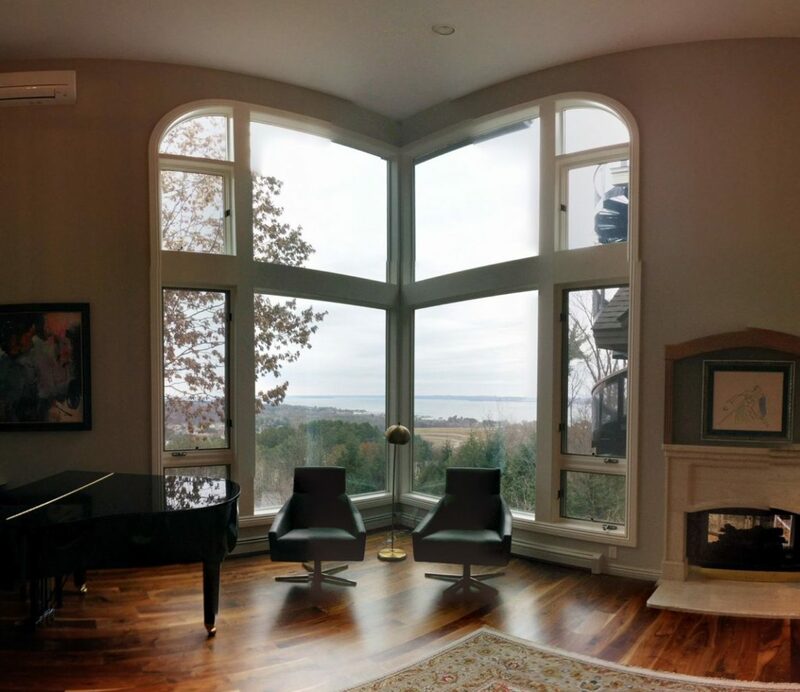 The owners of this lakeside home wanted to improve their home’s comfort and protect the interior flooring and furnishings by controlling the sun streaming through these picturesque windows. However, they did not want to utilize anything that would take away from these stunning views of Grand Traverse Bay. After consultation, we agreed to install a residential window film from Vista called Spectra Select 60. Spectrally-selective films offer excellent heat rejection, energy savings and are virtually invisible. They’re made with advanced technologies that single out regions of the solar spectrum resulting in a film that lets in more light than heat. Great for applications where maintaining the look of existing glass is highly important. These films are ideal for a home with views like this or one where the owners want very little change in appearance. This particular film is barely detectable on the glass, but reduces the total solar energy by 55%, the glare by 27% and eliminated over 99% of the sun’s harmful UV rays. Vista residential window film is a smart alternative to window replacement. If you are interested in learning more about how Vista residential window film can provide an enhanced view while still adding sun protection to your home, click HERE. You can also give us a call today at (231) 943-9773 or Contact Us using our online form submission for an absolutely free, no obligation consultation and quotation on implementing home or business window film. Our service areas include Traverse City, Grand Rapids, Cadillac, Petoskey, Roscommon, Ludington, Michigan and the surrounding areas.